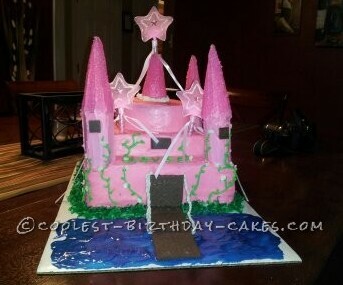 This castle cake was for a 4 year old little girl whose favorite color is pink and believes she is a princess. I made a 12×12 square cake, a 10″ round cake and a 6″ round cake. I made the icing using powdered sugar, 1 stick of butter, 1 tsp of vanilla and milk to make creamy. Save some of this for making white flowers. Color the icing with pink food coloring. Place the square cake on the cake board and icing it, then place the larger round cake on top and icing it and finally place small round cake on top an icing it. For the towers I used toilet paper rolls and ice cream cones. Icing the toilet paper rolls with the icing as well as the cones. Roll the cones in pink sprinkles. Place the rolls at each corner of the square cake then place the cones on top of the rolls. Place a cone with icing and sprinkles on top of small round cake. I then took the white icing and made a ring around the cone on the small cake. I dyed some icing green and made vines going up the walls of the castle with white flowers on the tips of the vines. For the windows, doors and bridge I used chocolate Graham crackers. Cut the crackers for the windows and place one on each tower.The door is a half of the cracker and the bridge is a whole cracker. I braided white yarn for the chains of the bridge. The grass is coconut shavings colored green and the water is blue gel. I bought wands with stars on top and place them on the cake. This cake wasn’t hard it just took about 2 hours to complete after the cakes were made. Icing the rolls and cones were challenging because I think I got more icing on me. The little princess loved the cake as well as all of her party guess. She didn’t want to cut the cake but they did. Birthday cake idea Posted by Danielle M.